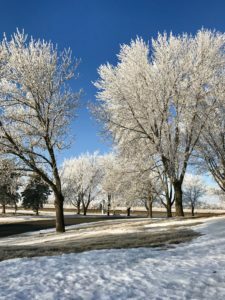 Winters on the northern prairie often feature temperatures in the double digits below zero during so-called “polar vortex” events. During these times the wild beauty of the prairie shrouded in white can be as breathtaking as the wind chills! This picture was taken just outside the city of Ellendale in rural Dickey County, North Dakota and shows a beautiful sheathing phenomenon which happens when a foggy night leaves seemingly every twig on the trees encased in ice the following morning! ← Travel Tip: Stutsman County Autumn! WOW! A beautiful creation! Thanks for taking us there! Beautiful! Thanks for sharing it. Hope you are blessed this week.